A while back FORLOOP had an airline client who was at a loss around problems in relation to cabin risk analysis. Risk reduction was of particular concern, as the airline had no idea why some incidents were occurring more regularly than others, and whether issues were due to the equipment or the crew. FORLOOP's AI platform was used to remove the limitations of human judgement. Our airline client had years of hand written notes but didn't quite know where to start. In fact, they had 5 years of written notes in varying degrees of detail. They had concluded it would have been onerous for a person to look at the notes and make any sense of it. The task of properly interpreting all the information and coming to an accurate conclusion would have been near impossible. Apart from the sheer volume of data, human bias would have come into the analysis, perhaps creating false assumptions. The impact to the airline of getting it wrong was huge - both financially, and from an OH&S perspective. FORLOOP's team decided that the best methodology would be to digitise the handwritten logs across the entire fleet of aircraft. All the data was aggregated into a CORPUS, which generated topics and themes. This was done using Latent Semantic Analysis (LSA) and Linear Discriminant Analysis (LDA). Latent semantic analysis (LSA) is a technique in natural language processing, in particular distributional semantics, of analyzing relationships between a set of documents and the terms they contain by producing a set of concepts related to the documents and terms. Linear Discriminant Analysis (LDA) is pattern recognition and machine learning to find a linear combination of features that characterizes or separates two or more classes of objects or events. Both sets of analysis was run on FORLOOP's AI platform, looking for keywords and trends. By using AI, the analysis could be done with an open mind, and widely. The process was to look for keywords and patterns, pose specific questions, and repeat the process over and over. Each time the parameters were adjusted until conclusions could be derived. The end result for our airline client was that they had high risk in areas they had never even considered in the past. 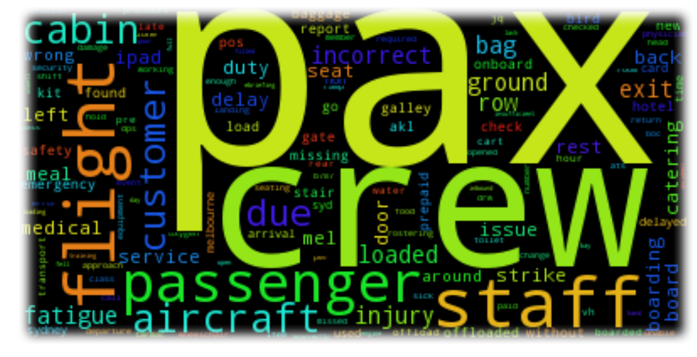 Keywords were coming up such as 'Cabin crew injuring left shoulder', 'baro-trauma', 'cargo roller', 'microwaves'. In business terms, they discovered that a recent price increase of passenger baggage fees to customers meant that passengers were sneaking on more hand luggage than before. This in turn created higher risk for the aircraft crew who were assisting in placing cabin luggage in overhead lockers - hence 'cabin crew injuring left shoulder'. A separate analysis revealed AI insights revealed an increase in microwave ovens break downs in aircrafts. A human may have incorrectly concluded that the equipment was at fault, when in fact the reason was the way the microwaves were being installed in certain aircraft types. Without the use of AI, accurate risk reduction analysis would have been near impossible. FORLOOP's AI platform was able to drill down and identify specific patterns, starting at the widest point, and drilling down to more specific questions as trends were identified. When we talk about AI for commercial airlines, the application of AI is not always obvious. There is a misconception that AI can be expensive or should be a longer term project. Both are untrue. As long as there is data and the team can articulate the business problem, there is a possibility to use AI to find the root cause. If your airline has specific problems which have been thrown into the 'too hard' basket, perhaps we can help you come up with a solution framework using AI. Feel free to contact us for a chat, or Subscribe to our newsletter to for regular updates.